This game is by the company Hothead and is very fun. You can get it through retail or through Steam. If you haven’t played this yet, I highly suggest doing so. It’s not a very long game, but it’ll keep you entertained for the entire duration of your game play 🙂 I commend Hothead on creating such a great game. I’m sure you’ll like it too so give it a shot! After all, you might as well if you don’t have it because a demo is available to try out for free. Mind you that these fixes work for Thongs of Virtue as well. Here’s a brief description of the game from the official Deathspank website: “Described by top scientists (and most reviewers, some of them scientists) as Monkey Island meets Diablo, DeathSpank is an exciting hack and slash action RPG set on a massive, dangerous, curvy world. 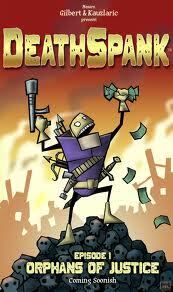 In between hacking and slashing, DeathSpank solves puzzles and explores an epic story. DeathSpank will vanquish evil and be a hero to the downtrodden; he will collect loot, level up, collect loot, acquire new abilities and collect loot.” Sounds good huh? Anyway, let’s get on to the topic of this page — the actual game fixes for the PC / Windows version of the game rather than the console versions (Xbox 360 and Playstation 3 / PS3). Some of these recommendations may help with the Mac / Macintosh version as well. These two errors prevent the game from running and seem to be most common with ATI cards. For example, the ATI Radeon x1950 Pro, x1650, HD 3800, and HD 5870. These D3D errors can be confusing as despite having support for the game, it still does not play. If your game controller is not working, then try plugging the game controller after the game is open rather than before it’s open. This may cause the game controller to register correctly and function as it should. If all goes well, then you’ll be able to play now. The “Continue Game” option should no longer be grayed out. However, if the *.sav file is corrupted, then the file itself is likely corrupted and unfortunately your data cannot be recovered. This is a DirectX DLL error. If you know any other game fixes for this game, please post them! Alternatively, if you are experiencing game problems and this guide doesn’t help you troubleshoot them / solve them, then leave a comment and we’ll try and help you out as soon as possible! This entry was posted	on Friday, November 19th, 2010 at 5:51 PM	and is filed under . You can follow any responses to this entry through the RSS 2.0 feed. You can leave a response, or trackback from your own site. It runs fine, but the menu screens (main menu, inventory etc) are scrambled and illegible. Any help would be greatly appreciated! im having the same problem as Lena, scrambled graphics (artifacts on screen) but the frame rate is no problem, please help! Till yesterday I had the same problem as Lena and allydacat, then I spent few hours trying to resolve it….and i find the solutions. The problem is the video card ATI mobility radeon x2300, which I have too. You have to upgrade your video card driver, but ATI doesn’t produce anymore driver for that video card. So you need an updated and modded driver. Just click “telechargement” to download the file. Note that in the description you can find the list of video cards compatible with that drive. Since, as far as I know, this problem is exclusive for this category of cards, just download that driver and you’ll be fine. I got the “d3dx9_43.dll is missing” error after installing and trying the game. I then downloaded and copied d3dx9_43.dll file in the folder with game exe. the game ran but the screen is just black. I could hear the correct audio in the background and can see the mouse only. updated drivers and directx stil not working. I’m using 1GB Nvidia GeForce 9500GT in Windows XP SP3 / Directx9. My game is got problem too. I run game normaly. I see the menu in game and then i want start new game. I click new game and game stop working. I cant get the in game sound to work, I have windows 7 and my sound card is Xonar DX. I have tried to reinstall the game and tried to get the game to play the sound trow the sound-card in my mother-card (Asus p8z68-v pro/gen3) with no success. I bought the game trough Steam. Sorry, that was for the second game of the franchise, the thongs of virtue.